SUMMARY: Jack Goodwin's family is wealthy. They own multiple horses, a huge plantation home, and are in the process of purchasing a race track. Seventeen-year old Savannah Barrow's family is broke. With thousands in medical debt and a new baby on the way, Savannah's family takes jobs at the Goodwin estate. As a sort of "horse whisperer," Savannah lands a job exercising the Goodwins' horses and hopes to one day become a jockey. Though they attend the same high school, Jack and Savannah come from two very different worlds. Can they overcome the forces determined to drive them apart? WHAT I LIKED: I LOVE Miranda Kenneally's books! I have read and reviewed all three previous Hundred Oaks books and had high praise for every one of them. Kenneally's books are like a drug for me--once I start reading them, it is almost impossible for me to stop. Characters from the previous Hundred Oaks books make cameo appearances. They are a little cheesy, but I liked them anyway. It's nice--albeit unrealistic for high school relationships--to see that things ultimately worked out for the couples who struggled so much in their stories. I am proud of Savannah and how she stands up for herself. She realizes she is responsible for her own life, and she takes that responsibility. 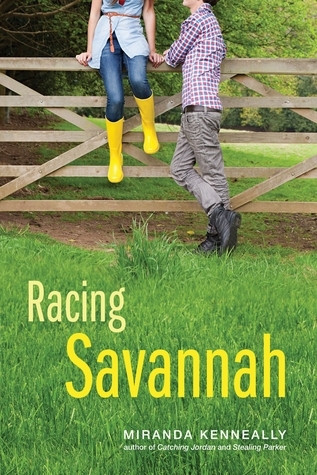 WHAT I DIDN'T LIKE: Racing Savannah is very readable, but I didn't devour it the way I did with Kenneally's other books. Savannah's dad drove me nuts. After getting his girlfriend pregnant and driving the family into further financial crisis, he has the nerve to judge Savannah's relationship with Jack? When the pregnant girlfriend can't work, Savannah steps into her place and requests that the girlfriend get the paycheck instead of Savannah. Savannah is a good girl who works hard and tries to do the right thing; she deserves the opportunity to make her own mistakes. Last, but probably the worst, is Jack. Kenneally usually does a fantastic job developing characters readers will love, but I didn't even like Jack. Why on earth would Savannah want anything to do with him? He's a cocky, arrogant player. He's flirtatious and kind one minute and moody and brooding the next minute. He wants to keep his relationship with Savannah secret and freaks out when Savannah dares to mention their relationship to her father. When it comes to his own father, he repeatedly weenies out instead of standing up for himself and Savannah. In a romance, the reader is supposed to want the couple to be together; I kept looking for someone else for Savannah. Too bad Rory was taken and Alex didn't work out. THE BOTTOM LINE: Meh. Fans of the series will want to read it, but it really isn't as good as Catching Jordan, Stealing Parker, and Things I Can't Forget. Despite my lukewarm reception of this one, I know I'll still read Book #5 when it comes out (there are six planned). STATUS IN MY LIBRARY: It's not out yet, but I can't get this for the middle school due to mature sexual content.